eTable 4. Assessment of the effect of changes in coding over time: Comparison of RRs and 95%CIs from different periods (2001-2003, 2004-2006, 2007-2009, 2010-2011). For the latter, period specific IPTWs were estimated to adjust for covariates. Hansen LG, Chang S. Health Research Data for the Real World: The MarketScan Databases. Ann Arbor, MI: Truven Health Analytics; 2009. Agency for Healthcare Research and Quality. Patient Safety Indicators Technical Specifications: Obstetric Trauma Rate: Vaginal Delivery With Instrument. Rockville, MD: Agency for Healthcare Research & Quality; 2009. Importance Glyburide is thought to be safe for use during pregnancy for treatment of gestational diabetes mellitus (GDM). However, there are limited data on the effectiveness of glyburide when compared with insulin as used in a real-world setting. Objective To estimate the risk of adverse maternal and neonatal outcomes in women with GDM treated with glyburide compared with insulin. Design, Setting, and Participants Retrospective cohort study of a population-based cohort from a nationwide US employer-based insurance claims database from January 1, 2000, to December 31, 2011. We identified women with GDM and their newborns. We excluded those with type 1 or 2 diabetes and those younger than 15 years or older than 45 years. Exposures Treatment with glyburide or insulin during pregnancy within 150 days before delivery. Main Outcomes and Measures We used binomial regression to estimate risk ratios (RRs) and risk differences with 95% confidence intervals for the association of glyburide with diagnosis codes for obstetric trauma, cesarean delivery, birth injury, preterm birth, hypoglycemia, respiratory distress, jaundice, large for gestational age, and hospitalization in the neonatal intensive care unit. Inverse probability of treatment weights were used to adjust for maternal characteristics that differed between the treatment groups. Results Among 110 879 women with GDM, 9173 women (8.3%) were treated with glyburide (n = 4982) or insulin (n = 4191). After adjusting for differences at baseline, newborns of women treated with glyburide were at increased risk for neonatal intensive care unit admission (RR = 1.41; 95% CI, 1.23-1.62), respiratory distress (RR = 1.63; 95% CI, 1.23-2.15), hypoglycemia (RR = 1.40; 95% CI, 1.00-1.95), birth injury (RR = 1.35; 95% CI, 1.00-1.82), and large for gestational age (RR = 1.43; 95% CI, 1.16-1.76) compared with those treated with insulin; they were not at increased risk for obstetric trauma (RR = 0.92; 95% CI, 0.71-1.20), preterm birth (RR = 1.06; 95% CI, 0.93-1.21), or jaundice (RR = 0.96; 95% CI, 0.48-1.91). The risk of cesarean delivery was 3% lower in the glyburide group (adjusted RR = 0.97; 95% CI, 0.93-1.00). The risk difference associated with glyburide was 2.97% (95% CI, 1.82-4.12) for neonatal intensive care unit admission, 1.41% (95% CI, 0.61-2.20) for large for gestational age, and 1.11% (95% CI, 0.50-1.72) for respiratory distress. Conclusions and Relevance Newborns from privately insured mothers treated with glyburide were more likely to experience adverse outcomes than those from mothers treated with insulin. Given the widespread use of glyburide, further investigation of these differences in pregnancy outcomes is a public health priority. Insulin is the only pharmacological treatment approved by the US Food and Drug Administration and endorsed by the American Diabetes Association for the treatment of GDM in the United States.5 Owing to its mechanism of action and ease of use, glyburide may be an appropriate first-line treatment alternative. Evidence from 3 trials suggests that, compared with insulin, glyburide may increase the risk of neonatal jaundice, hypoglycemia, and birth trauma,6-8 but these studies were not powered to detect small but clinically important differences in these and other adverse outcomes. Given the widespread use and rapid uptake of glyburide in the last decade, further evaluation of the comparative safety and effectiveness of glyburide is needed.9 The purpose of this study was to estimate the risks of adverse pregnancy outcomes among women receiving glyburide compared with insulin for the treatment of GDM in a US population-based cohort. We conducted a retrospective cohort study of women with GDM identified in the Truven Health Analytics MarketScan Research Databases from January 1, 2000, to December 31, 2011. This database contains individual-level, deidentified health care claims from employees, spouses, and dependents who are covered by employer-sponsored private health insurance. It is one of the largest collections of employer- and health plan–based patient data in the United States, with approximately 30 million lives annually from January 1, 2000, to December 31, 2011, covering all US census regions.10 The database includes inpatient and outpatient medical claims linked to outpatient pharmacy data and person-level enrollment information. Truven Health Analytics reviews all claims and enrollment data to ensure completeness, accuracy, and reliability. This study was considered to be exempt from further review by the Public Health–Nursing Institutional Review Board, Office of Human Research Ethics, University of North Carolina at Chapel Hill. Informed consent was not required from patients because this was a retrospective study using deidentified data. We identified women with claims for delivery of a live-born infant through the use of International Classification of Diseases, Ninth Revision (ICD-9) diagnosis and procedure codes as well as Current Procedural Terminology (CPT) codes (eTable 1 in the Supplement). Because multiple claims can be generated during delivery of care, we grouped those occurring consecutively and defined delivery date as the date of the earliest claim. Women were included in the cohort if they (1) had a diagnosis code for GDM (ICD-9 codes 648.8-648.83) prior to delivery, (2) were continuously enrolled during the year prior to and 3 months after the delivery date, and (3) had their first pharmacy claim for glyburide or insulin within 150 days of delivery. We excluded women (1) with diagnosis codes for type 1 or 2 diabetes, (2) younger than 15 years or older than 45 years, or (3) with diagnosis or procedure codes for pregnancy with multiple gestations. Our cohort was restricted to the first eligible pregnancy with GDM for a given woman. We linked women in our cohort to newborns listed under the same policy whose first claim occurred during the same calendar year as the maternal delivery date. To refine the linkage, we required the date of the potential newborn’s first claim to be within 30 days of the delivery date. To be considered part of the cohort, infants had to be continuously enrolled for 3 months after the delivery date to ascertain use of health services. We identified women in our cohort with a pharmacy claim for insulin or glyburide in the 150 days prior to delivery. The index date was defined as the date for the first claim for glyburide or insulin before delivery. Women with a prescription earlier than 150 days prior to delivery were excluded as use of these medications in early pregnancy is more likely to suggest prepregnancy type 2 diabetes than GDM. Classification as an insulin or glyburide initiator was based on the drug class of the first pharmacy claim. Duration of glyburide or insulin treatment was defined as the number of days between the index date and delivery date, assuming that discontinuation of treatment only occurred after birth. We identified characteristics that are risk factors for the outcomes and that influence choice of therapy (insulin or glyburide) for GDM. All characteristics were defined through the use of ICD-9 diagnosis codes, CPT codes, or pharmacy claims and assessed before the index date (eTable 1 in the Supplement). Comorbidities of interest were infertility diagnosis or treatment (≥1 claim for clomiphene citrate, urofollitropin, follitropin, menotropins, ganirelix acetate, or cetrorelix acetate), obesity, hypothyroidism, hyperandrogenism, metabolic syndrome, and polycystic ovarian syndrome. Because preeclampsia and gestational hypertension could affect outcomes and onset of GDM, we identified whether these conditions occurred before the index date. Preeclampsia was defined as any inpatient stay with a primary or secondary diagnosis code for preeclampsia; gestational hypertension was defined through the use of pharmacological treatment (earliest claim after index date for methyldopa, calcium channel blockers, β-blockers, or α-blockers). Because metformin hydrochloride is used off label for infertility or to reduce risk of miscarriage, we included history of metformin use as a covariate in the analysis. We used binomial regression to estimate crude risk ratios (RRs), adjusted RRs (aRRs), crude risk differences (RDs), and adjusted RDs (aRDs). To estimate the unadjusted association, we used a model with the exposure as the only variable. We then applied inverse probability of treatment weights and estimated the adjusted risks. Robust variance was used to estimate 95% confidence intervals for the association between glyburide vs insulin and adverse outcomes, carrying the first exposure forward. Women were not excluded if discontinuing, adding, or switching treatments, similar to an intent-to-treat approach. Model fit was assessed using a standardized Pearson χ2 test. We conducted sensitivity analyses to evaluate the influence of residual confounding by maternal obesity (described in eAppendix 1 in the Supplement; results from these analyses are reported in eTables 2-4 in the Supplement). All analyses were conducted using SAS version 9.3 statistical software (SAS Institute, Inc). We identified 110 879 women with GDM and their newborns. Of these women, 9173 (8.3%) initiated pharmacotherapy, including 4982 (54.3%) treated with glyburide and 4191 (45.7%) treated with insulin. Baseline characteristics of women by treatment status appear in Table 1. The mean (SD) age was 33.5 (4.7) years. The proportion of the cohort treated with glyburide increased from 8.5% in 2000 to 64.4% in 2011. For both glyburide and insulin, women had a minimum of 1 day of treatment and a maximum of 150 days, consistent with our cohort definition. The mean (SD) duration of treatment with glyburide was 50.4 (27.1) days (median, 47 days), while for insulin the mean (SD) was 54.1 (28.6) days (median, 50 days). Of the 9173 women in the cohort, 451 (4.9%) added a second medication or switched treatments after initiation. None started both medications on the same day. Among those treated with glyburide, 406 (8.1%) had a change from initial treatment, with the majority using insulin (333 women [82.0%]). Only 45 (1.1%) of those in the insulin group had a change from initial treatment; the majority (31 women [68.9%]) added or switched to glyburide. Obesity and hospitalization for preeclampsia were more common in the glyburide group, while hypothyroidism and infertility treatment were more common in women treated with insulin. There were no differences between groups in metformin use prior to the index date (Table 1). After applying the inverse probability of treatment weights, the 2 groups were balanced in terms of baseline covariates (all standardized mean differences <0.05) with the exception of the ICD-9 diagnosis code for metabolic syndrome, which was present in fewer than 1% of both groups. Table 2 shows the results of the adjusted analyses for the risk of adverse maternal and neonatal outcomes in women initially treated with glyburide compared with those receiving insulin (results of crude analysis are presented in eTable 5 in the Supplement). Compared with insulin, we observed a higher risk of NICU admission (aRR = 1.41; 95% CI, 1.23-1.62), respiratory distress (aRR = 1.63; 95% CI, 1.23-2.15), neonatal hypoglycemia (aRR = 1.40; 95% CI, 1.00-1.95), birth injury (aRR = 1.35; 95% CI, 1.00-1.82), and large for gestational age (aRR = 1.43; 95% CI, 1.16-1.76) among newborns whose mothers were treated with glyburide. Women treated with glyburide, as compared with those treated with insulin, were not at increased risk for obstetric trauma (aRR = 0.92; 95% CI, 0.71-1.20), preterm birth (aRR = 1.06; 95% CI, 0.93-1.21), or jaundice (aRR = 0.96; 95% CI, 0.48-1.91). The risk of cesarean delivery was 3% lower in the glyburide group (aRR = 0.97; 95% CI, 0.93-1.00). The RD per 100 women associated with receipt of glyburide vs insulin was higher for admission to the NICU (aRD = 2.97%; 95% CI, 1.82-4.12), large for gestational age (aRD = 1.41%; 95% CI, 0.61-2.20), and respiratory distress (aRD = 1.11%; 95% CI, 0.50-1.72) (Table 2). The corresponding numbers needed to treat to harm were 36 (95% CI, 25-60) for NICU admission, 71 (95% CI, 46-164) for large for gestational age, and 96 (95% CI, 61-233) for respiratory distress. In a population-based cohort of 9173 women with GDM managed by pharmacotherapy, we found an association between the use of glyburide (compared with insulin) and an increased risk of adverse events. Admission to the NICU, respiratory distress, and large for gestational age were more likely to occur among women treated with glyburide. Smaller differences between treatment groups were found for obstetric trauma, cesarean delivery, jaundice, and preterm birth. Previous literature on the association between treatment with glyburide and adverse neonatal outcomes is limited. To date, 3 trials with a total of 268 women and 3 observational studies have assessed the safety or effectiveness of glyburide compared with insulin in pregnancy.6-8,18-20 The trial by Langer et al6 was by far the largest of the three (n = 201) and was the only one to examine NICU admission, respiratory distress, and jaundice, leading us to focus on the interpretation of our findings in the context of those by Langer et al. While the point estimates appear to differ from those of Langer et al in some instances (Figure), the estimates from our study fall within the confidence limits of those by Langer et al for all of the outcomes. Given our much larger sample, we have been able to characterize the differences in outcomes between women treated with glyburide vs insulin with much greater precision. It is also possible that differences of risk estimates between studies could be explained by differences in outcome ascertainment. Because criteria for admission to the NICU may be more or less conservative in a standardized protocol for the trial compared with general practice, our results may be more representative of practice patterns related to newborn care across the United States. Our results for NICU admission are also consistent with previously published work from Cheng et al.18 Compared with the trial, our definition of respiratory distress identified critically ill infants and did not include less serious diagnoses such as transient tachypnea of the newborn. Therefore, our estimates for respiratory distress reflect more severe conditions requiring NICU admission. The same principle applies to jaundice and neonatal hypoglycemia where the trials identified newborns based on predefined bilirubin or blood glucose (for hypoglycemia) cutoff values, while our study identified newborns with jaundice or hypoglycemia who required care in the NICU. Because large for gestational age was defined through the use of ICD-9 codes, coding for this diagnosis may include both macrosomia or large for gestational age; this could affect our estimates, underestimating the risk. Birth injury and preterm birth were not assessed in the clinical trials. The observational studies by Jacobson et al7 and Ramos et al20 reported higher odds of birth injury among those in the glyburide group (RR = 3.03; 95% CI, 0.81-11.28; and RR = 3.55; 95% CI, 0.33-38.0, respectively), but these estimates are extremely imprecise and based on few events. The populations of these studies were largely Hispanic and insured by Medicaid, whereas our study comprised individuals with employer-based insurance. Even though not statistically significant in our study, the risk of birth injury is consistent with previously reported results and should be considered (Figure). Compared with the clinical trials and observational studies, our study population makes our findings more precise and potentially more generalizable than those of previous studies. Limitations of our study include absence of information on gestational age, no ascertainment of stillbirths, lack of information on race/ethnicity and sociodemographic variables, and the potential for unmeasured confounding. Although we were unable to identify the precise beginning of pregnancy, by using a validated approach and only including those treated within 150 days of delivery we believe our cohort is reflective of patients with true GDM.21 Owing to absence of linkage with death certificate data, we were unable to adequately ascertain stillbirths or neonatal deaths. Previous studies have shown heterogeneity in the risk of adverse neonatal events by race or sociodemographic status. However, there is no evidence of differences by race after women initiate pharmacological treatment, and the role of these factors in the selection of pharmacological treatment has not been determined. We do not have data on the severity of glucose intolerance for the population, although analysis of a subgroup with laboratory results found no indication that baseline levels of glucose intolerance differed between the groups (eAppendix 2, eTable 6, and eTable 7 in the Supplement). Because this population represents those with employer-based insurance, results from this study may not be generalizable to uninsured individuals or those covered by Medicaid. Residual confounding due to differences in obesity between the groups is also a potential concern. Previous studies have shown that use of ICD-9 codes for obesity has a high positive predictive value (93%) but low sensitivity.21 Thus, our definition of obesity is more likely to capture morbidly obese women. We assessed whether the effect of obesity on outcomes could be differential between treatment groups. Our secondary analysis shows that the effect of obesity on outcomes is consistent with that reported in previous studies and in the same direction for both treatment groups.22-24 In a previous analysis, we observed that obesity was not associated with the choice of treatment.9 Therefore, although obesity is likely underreported in our cohort, this is not sufficient to explain the observed differences between the treatment groups (eAppendix 1 and eTables 2-4 in the Supplement). To our knowledge, this is the largest US population-based study to date to assess the comparative effectiveness of glyburide in pregnancy. Patterns observed in our data set reflect usual care among the employed and insured population in the United States, whereas clinical trials include a highly selected patient population treated under standard protocols and consistent monitoring. When compared with self-report, ascertainment of initiation of treatment through pharmacy claims is substantially improved; however, we are unable to ascertain initial dosage and dosage escalation, which affect glucose control. Because serious maternal and neonatal outcomes are relatively rare, large claims databases provide a unique opportunity to study the safety and effectiveness of medications in pregnancy. A higher risk of neonatal outcomes associated with glyburide-treated women demands further attention. Prevention of neonatal outcomes has short-term effects in terms of morbidity and costs of care. In addition, recent studies have suggested a link between metabolic disturbances in the neonatal period and the risk of insulin resistance or obesity in childhood or adulthood.25,26 Clinically, this implies that better management of women treated with glyburide is needed. Evidence-based recommendations are needed to provide guidance regarding dosing and to identify women more likely to benefit from glyburide. After accounting for maternal comorbidities and risk factors for neonatal outcomes, we found an association between glyburide (compared with insulin) and elevated risk of NICU admission, neonatal hypoglycemia, respiratory distress, birth injury, and large for gestational age in women with GDM. These results are consistent with findings from prior studies and suggest that women with GDM being treated with glyburide may not be achieving adequate glucose control. Corresponding Author: Michele Jonsson Funk, PhD, Department of Epidemiology, CB 7531, University of North Carolina at Chapel Hill, 104B Market St, Chapel Hill, NC 27599 (mfunk@unc.edu). Accepted for Publication: January 10, 2015. 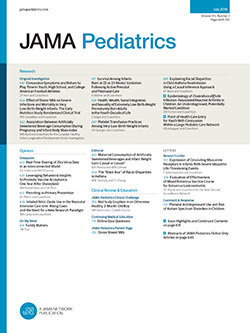 Published Online: March 30, 2015. doi:10.1001/jamapediatrics.2015.74. Author Contributions: Drs Camelo Castillo and Jonsson Funk had full access to all of the data in the study and take responsibility for the integrity of the data and the accuracy of the data analysis. Study concept and design: Camelo Castillo, Brookhart, Benjamin, Jonsson Funk. Acquisition, analysis, or interpretation of data: Camelo Castillo, Boggess, Stürmer, Brookhart, Jonsson Funk. Drafting of the manuscript: Camelo Castillo, Jonsson Funk. Statistical analysis: Camelo Castillo, Stürmer, Brookhart, Jonsson Funk. Obtained funding: Stürmer, Benjamin, Jonsson Funk. Study supervision: Boggess, Stürmer, Brookhart, Benjamin, Jonsson Funk. Conflict of Interest Disclosures: Drs Stürmer and Jonsson Funk reported receiving salary support from the Center for Pharmacoepidemiology, which is currently funded by unrestricted grants from GlaxoSmithKline, Merck, and UCB Biosciences. Dr Stürmer reported receiving investigator-initiated research funding and support from the National Institute on Aging, the National Cancer Institute, and the Patient-Centered Outcomes Research Institute; research funding from the Agency for Healthcare Research and Quality to the DEcIDE Network center at the University of North Carolina at Chapel Hill; and research support from Amgen, Genentech, Merck, and Sanofi to the Department of Epidemiology, University of North Carolina at Chapel Hill. Dr Brookhart reported receiving investigator-initiated research funding from the National Institutes of Health, the Agency for Healthcare Research and Quality to the DEcIDE Network center at the University of North Carolina at Chapel Hill, and the Patient-Centered Outcomes Research Institute; receiving research support Amgen; serving on advisory boards for Amgen, Merck, and Pfizer (honoraria received by the University of North Carolina at Chapel Hill); receiving consulting fees from RxAnte, Inc and World Health Information Science Consultants, LLC; receiving investigator-initiated grant support from Amgen; and serving as a scientific advisor for Pfizer, Amgen, Merck, and Rockwell Medical (he has not accepted personal compensation for his service; honoraria were declined, received by the institution, or donated). Dr Benjamin reported receiving research grants from Astellas Pharma US, AstraZeneca, and UCB Pharma that support the expenses associated with projects in Duke University Health System under his direction; and receiving personal income outside of his salary from Duke University for consulting or other non-CME services from Astellas Pharma US, Biosynexus, Cempra, Cubist Pharmaceuticals, Johnson & Johnson Pharmaceutical Research and Development, Merck & Co, Pfizer, and The Medicines Co. No other disclosures were reported. Funding/Support: Dr Jonsson Funk was supported by grant K02HS017950 from the Agency for Healthcare Research and Quality. The database infrastructure used for this project was funded by the Department of Epidemiology, Gillings School of Global Public Health, University of North Carolina at Chapel Hill; the Cecil G. Sheps Center for Health Services Research, University of North Carolina at Chapel Hill; and the School of Medicine, University of North Carolina at Chapel Hill. Previous Presentation: This paper was presented at the 34th Annual Meeting (The Pregnancy Meeting) of the Society for Maternal-Fetal Medicine; February 6, 2014; New Orleans, Louisiana. Additional Contributions: Virginia Pate, MS, University of North Carolina at Chapel Hill, Chapel Hill, assisted with programming and data management; she received compensation from grant K02HS017950 from the Agency for Healthcare Research and Quality. We thank the Center for Women’s Health Research at the University of North Carolina at Chapel Hill for their support during the realization of the study.